Please contact us before your visit to help develop your research strategy and to inquire about specific sources. We want to ensure that we have the sources you need. Also known as: Umar Ibn Said, Umeroh, Moro, Omora, Meroh, Moreau, Uncle Moreau. (b. circa 1770, d. 1864) Great academic interest and legend surround the life of Omar Ibn Sayyid, a Muslim African slave who lived in the southern states in the early 1800s. He was likely the most educated slave in North Carolina, as well as the author of the only known slave autobiography written in a native language. Lastly, he is one of the best documented examples of a practicing-Muslim slave. His Bible resides in the Davidson College Rare Book Room, with additonal material in the Davidson College Archives. Donated by Mrs. Ellen Guion in 1871, this Bible is a 1811 Newcastle-upon-Tyne translation into Arabic. This particular volume has Arabic notations written by Omar. The timeline which follows has been gleaned from numerous articles about Omar Ibn Sayyid. However, the details of his life have been hotly debated. This timeline can only serve as a general guide. Omar ibn Sayyid is born in the African kingdom of Futa Toro (modern Senegal) to a wealthy family. Omar and his family are adopted by his uncle. Omar is raised and educated as a Muslim. Omar claims to have worked first as a teacher and then as a merchant. Omar is captured and sold as a slave under unknown circumstances. He enters the Charleston harbor as a slave aboard the ship Heart of Oak, only one month before the United States abolishes the importation of slaves. Omar is sold to a kindly master, who dies after only a year. Omar runs away from his new master due to harsh work conditions. Omar is captured in Fayetteville, NC. He barely speaks English and scrawls unknown markings (which he later explained were Muslim prayers) with charcoal on the walls and floor of the jail. Omar is released from the Fayetteville jail. He is purchased and released from jail by James Owen, owner of Milton Plantation on the shore of Cape Fear River. James is a prosperous politician, as is his neighbor and brother John (who later became governor of North Carolina). James and John Owen become interested in the educated Omar. Omar is given his own cabin, good meals, and work as a type of overseer. The family purchases for Omar a translated copy of the Quran to help improve his English. – Posted gris-gris (an African Muslim tradition of warding off evil spirits by posting pieces of the Quran). The Owens purchase an Arabic translation of the Bible for Omar. At the urging of the Owens, Omar studies his Arabic Bible and attends daily Bible meetings. 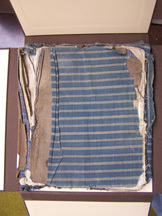 Omar carefully perserved the Bible, covering each worn out cover with new cloth. Omar joins the First Presbyterian church and thereafter regularly attends church with the Owen family. July 1825: A Fayetteville resident writes a widely printed (and largely fantastical) article about Omar, bringing national attention to him. 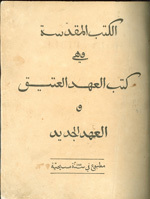 1831: Omar writes an autobiography of his life in Arabic. The autobiography is written in correspondence to Lahmen Kebby (also known as Old Paul or Lamine Kebe). Lahmen is another educated Islamic slave from Futa Toro. Modern scholars have doubted the accuracy of many details in the autobiography. Omar was noted for being obscure and evasive when speaking about his life in Africa. 1835 circa: The Owens move to Wilmington, NC. The move to an urban area increases the public’s access to Omar. 1837: Omar attempts to convert native Africans through Lahmen Kebby. Lahmen and Omar had remained in contact since 1831. 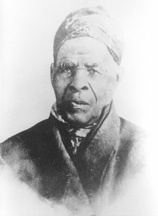 Lahmen was freed in 1835 by his master after forty years of slavery and had spent the last two years in New York under the care of the American Colonization Society. Before Lahmen sets sail for Liberia, Omar sends him a copy of the Bible in Arabic (not the copy given to him in 1819 by the Owens) and asks him to share it with the other Liberians. 1837 Fall: Omar declines the opportunity to return to Africa. The American Colonization Society and James Owen offer to send Omar as a missionary to Africa. Omar declined the offer, just as he had declined previous opportunities to return. Omar’s aversion to speaking about his past and toward returning to Africa was clear, but his reasons remain a mystery. 1845: Omar’s popularity resurges again. Many tall tales had developed, including the story that he was actually an Arab prince trained as a scholar, who was enslaved when he wandered south. 1846: Omar once again attempts to convert native Africans. Omar appeals to American Bible Society to send Arabic translations of the Bible to the Muslims of Futa Toro. 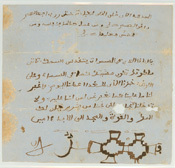 There is evidence that the society received his letter via James Owen and did attempt to give copies of the Bible to traders passing through Beirut. Their initial attempts were not successful, most likely due to the poor Arabic translations of the Bible available at that time. 1862: The Owens move from Wilmington to James’ Cape Fear plantation, Owen Hill. Omar never married, though the Owens often urged him to. He is buried at Owen Hill, though his tombstone is now lost. 1865: Christianity to his people. Reverend Daniel Bliss (president of the Syria Protestant College) learns about Omar and Lahmen Kebby, the presence of Islam in Africa, and of Omar’s desire to have the Bible sent to his people in Futa Toro. He is inspired to send missionaries and improved Arabic translations of the Bible to Liberia. 1871: Omar’s Bible is given to Davidson College by Mrs. Ellen Guion, the daughter of Governor James Owen. She became acquainted with Davidson College through the Williams Society, a mission society based at the college. 1991: A Fayetteville mosque renames itself in his honor: Masjid Omar Ibn Sayyid. 1996 March 28: Omar’s original autobiography is purchased at auction. Omar Ibn Sayyid still features prominently in many modern scholarly works and areas of research. He remains a figure of interest as one of the (if not the) most educated slave in North Carolina, as the author of the only known autobiography of a slave written in a native language, and one of the most documented examples of a practicing-Muslim slave. Debates and legends about this fascinating figure give every appearance of continuing. Callcott, George. H. “Omar ibn Seid’s Unique Autobiography.” The State Magazine 19 April 1953. Graham, Mary Owen. “Autobiography of Omar ibn Said, Slave in North Carolina 1831.” American Historical Review 30.4: 787-795. Hagy, James. W. “Muslim Slaves, Abducted Jews, Misnamed Turks, & an Asiatic Greek lady: Some Examples of Non European Religious & Ethnic Diversity in South Carolina Prior to 1861.” Catalogue Spring 1993: 12-27. Parramore, Thomas C. “Muslim Slave Aristocrats in North Carolina.” The North Carolina Historical Review April 2000: 127-150. Parramore, Thomas C. “Said, Omar Ibn.” Dictionary of North Carolina Biography, v 5 Ed. William S. Powell. Chapel Hill: U of NC P, 1994: 278. McMahan, Margaret. “Bladen Slave Was Also a Prince.” Fayetteville Observer 7 May 1987: E1. Park, Leland. 27 March 1997.Summary of a phone conversation with Mr. Wyatt H. Day. Omar ibn Sayyid Artifacts Davidsoniana file. Davidson College Archives, Davidson, NC. Pharr, Jim. “Moslems [sic] Plan Dedication.” 27 Apr 1991: A8. “Prince Moro.” The African Repository and Colonial Journal 1825: 152-153. Unknown author. 17 March 1929. Article on the old churches of the Faytteville community transcribed onto Library of Davidson College letterhead. Omar ibn Sayyid Davidsoniana file. Davidson College Archives, Davidson, NC.